Little N has reached the age where he has totally outgrown sippy cups and now prefers to use open cups. Drinking from an open cup is no problem at all, but preventing him from knocking his drinks over is! The anywayup 360° Toddler Cup* from Haberman offers the perfect solution to this by creating a toddler cup with an innovative circular valve system. This allows toddlers to drink from anywhere around the rim, like they would with an open cup, but without the worry of leaks or spills. N absolutely loves his brightly coloured anywayup 360° Toddler Cup. He chooses it over any other cup, even his beloved Lego Batman cup. The circular valve truly does allow him to gently sip from anywhere around the rim and the sturdy handles make it easy for his little hands to hold. The cup also has a lid which is actually pretty difficult to remove, but it means that we can take the cup out and about with us and not have to worry about it leaking. It's made from very sturdy plastic and I'm confident it could withstand being dropped without breaking. I'm always a bit fussy about toddler cups that have valves or other small fiddly parts, as I worry about getting them clean properly. I've had cups before where you can't quite get into all the crevices to clean them and, well, it's not very pleasant! 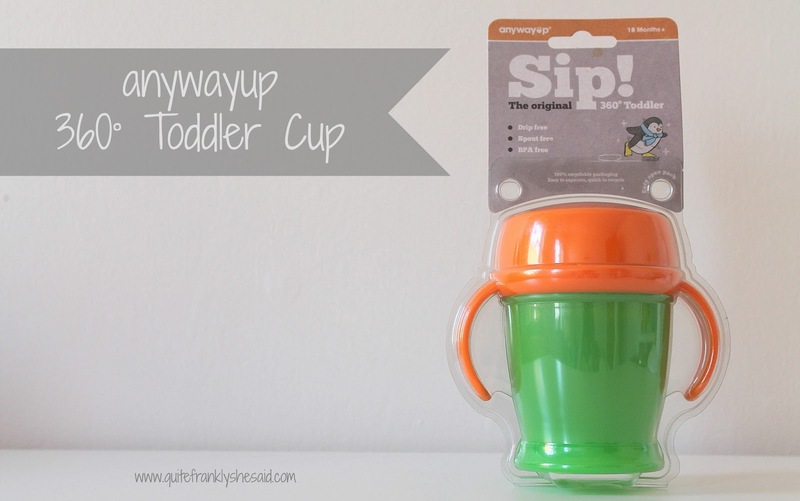 The anywayup 360° Toddler Cup comes apart really easily however. The top unscrews, then the valve system unclicks with a simple push from beneath. My inner clean-freak is very happy with this. N really likes this cup and so do I actually. I think it's the perfect way to transition toddlers from sippy cups to open cups, especially when they're going through clumsy stages. Keep up to date by following me on Twitter! *I was sent the anywayup 360° Toddler Cup for review, however all thoughts and opinion are my own. We have a similar cup from Munchkin and the idea is great. Might test this one to see how it compares.